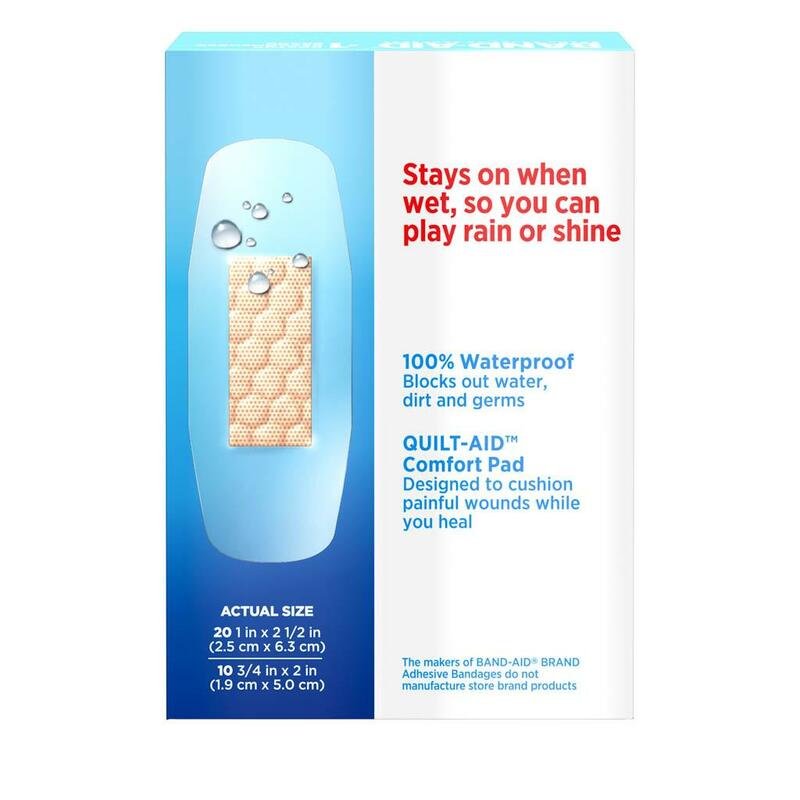 100% Waterproof BAND-AID® Brand WATER BLOCK® Adhesive Bandages stay on even when wet and feature a four-sided adhesive that keeps pad dry while blocking out water, dirt and germs. The QUILT-AID™ Comfort Pad is designed to cushion painful wounds while you heal. 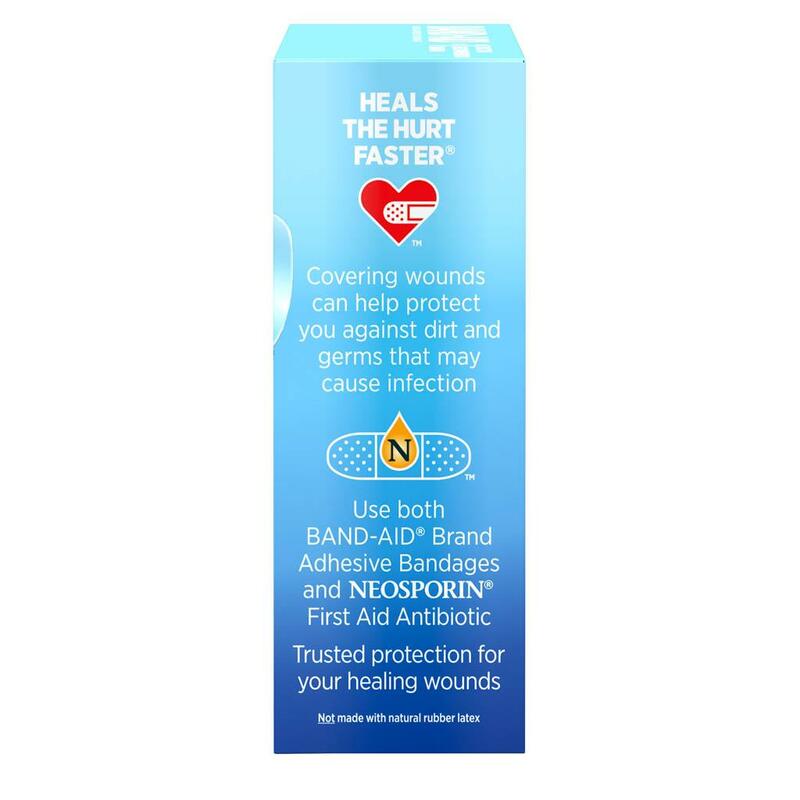 BAND-AID® Brand WATER BLOCK® Adhesive Bandages have a nonstick pad, allowing for gentle removal. This package contains 30 sterile bandages, in assorted sizes. Band-Aid clear water block strips are useless. 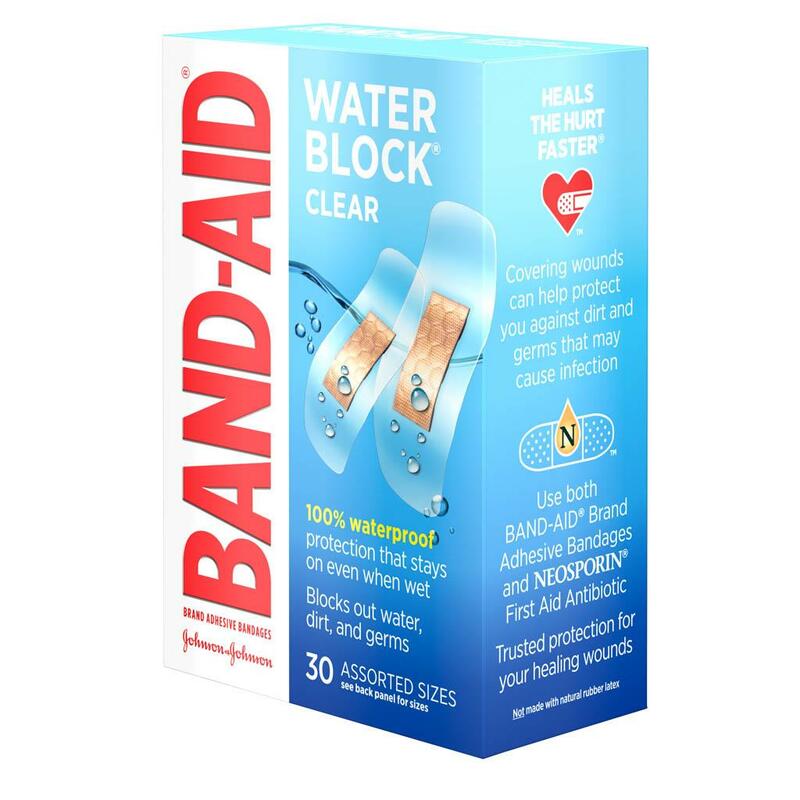 The Band-Aid water block clear strips wrinkles instantly. I couldn't get it on straight. I threw away three water block clear Band-Aids before I got one on without major wrinkles in it! The tape is so small in comparison to the bandage! What a waste of money! I'm returning them to Costco. We're very sorry to hear that! Please give us a call at 1-866-565-2873 so we can help make this right. We're available Monday-Friday from 9am to 5:30pm ET. We hope to hear from you soon! 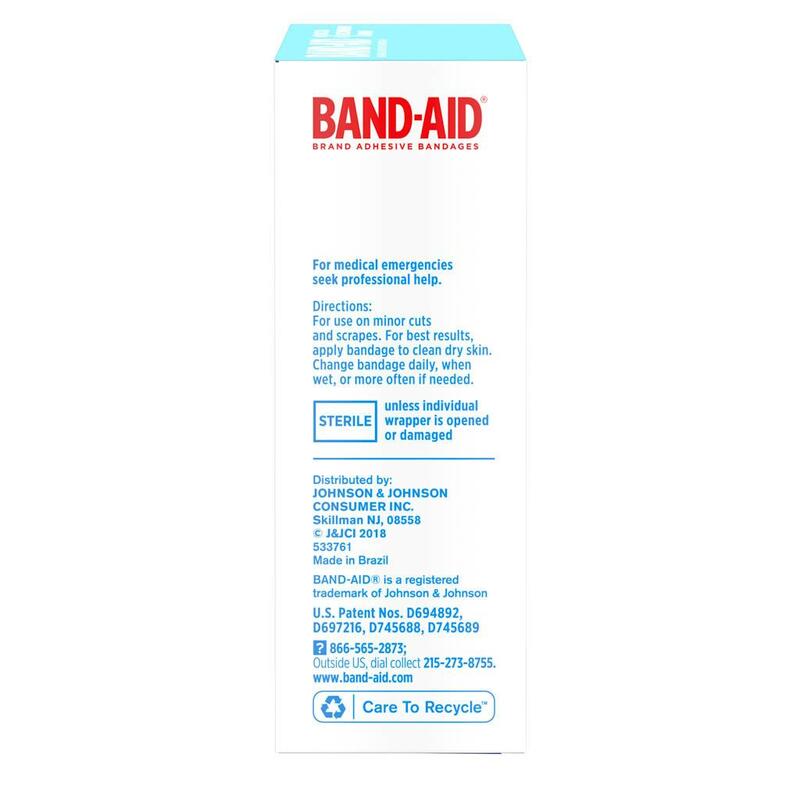 This type of bandaid is great to use when you need to cover a cut so you can shower! Love this type of bandaid! They will always be in my first aid kit!! Do NOT use these on children! I think this is actually a dangerous product. I bought them to use on my son, when we were at the beach. After wasting the first couple ones (they are extremely thin and sticks to itself, and the actual pad part is very tiny compared to the size of the bandage, which means you need to use a much larger bandage than usual if you don't want the sticky part on your cut. Which you don't, of course. The plus (and minus!) is...they definitely stay on in water. I forgot to change it until the next day, at which time the bandage had caused a rectangular-shaped welt (at the edges of the pad) on his skin. A week later, the scar FROM THE BANDAGE is still visible. I threw these away, they are absolute garbage. We want to hear more about this and see how we can help. Please give us a call at 1-866-565-2873. We're available Monday-Friday 9AM-5:30PM ET. When you call mention your username to our team. We hope to chat soon. The adhesive is difficult to remove from the skin and leaves a stcky residue on the skin and nail. The clear plastic is also difficult to remove from the skin, as it stretches without easy release. Yes it is waterproof but not worth the effort to remove it. We're sorry to hear about this! We would like to learn more about your experience using our bandages. Please give us a call at 1-866-565-2873 M-F between the hours of 9A-5:30P ET. Thank you and have a great day. Won’t buy these again. What a waste of time and money. Extremely difficult to use!!!! They stick to themselves upon opening and it’s too frustrating (if not impossible) to use after that; ESPECIALLY while bleeding. But my second gripe about these is that on the front of the box it says 30 assorted sizes and there was only ONE size in this box, all of which are too small for my needs. PERHAPS they are indeed available in assorted sizes, but I interpreted and understood the label on box to mean that this actual box contained a variety of multiple sizes. And it did NOT. The exact size and count should be MUCH MORE clearer of the FRONT of the box. This product and packaging is a let down and not what I’ve come to expect from Johnson & Johnson. We're sorry to hear about this! We would like to learn more about your experience using our product. Please give us a call at 1-866-565-2873 M-F between the hours of 9A-5:30P ET. Thank you and have a great day! I was so excited to find a water block Band-Aid since I frequently had to reapply the bandage after washing my hands. Contrary to my initial excitement before the purchase, this version of Band-Aid turned out to be the most frustrating one. Each time I wanted to use the bandage, I had to throw one first as it kept sticking to itself. Basically, this product only allows 50% usage. I've never written any product review. However, this bandage was so maddening to use. And, it was so disappointing as it was manufactured by Johnson and Johnson, which should guard its goodwill with customers. Those who produced this bandage must have been in a rush to sell. If they ever tried to use it themselves, they would have abandoned it as soon as possible or adjust the idea or the product. That is how poor this product it is. So I had a small leaky hole in my foot and decided to use one of these band-aids since I would have to shower eventually. It works very well and kept out all the water. In fact, it stuck so well, that I had a hard time removing it from myself when I needed to pull it off. Despite several attempts I simply could not lift a single end to peal it off. I had become one with the band-aid! I finally managed to pinch the middle and slowly separate it from my skin, removing it from my foot. But the hole no longer leaks and it was dry. Thank you for sharing your experience with us and we'd like to learn more. Please give us a call at 1-866-565-2873, Monday - Friday from 9 AM to 5:30 PM ET. We look forward to speaking with you!